Drafting and discussion of the terms of the agreement with sub-contractor “Caucasus Solar” Ltd for the construction of 2000 l total capacity solar thermal system consisting of 10 units of 200 l capacity pressurized integrated system made of 70 mm diameter super vacuum tubes, 200 l tank and electric heating element, electronic controller to meter thermal energy output. A special attention in the agreement was paid to the HSE requirements with emphasis to working on heights and observation of BP Golden Rules of Safety. The sub-contract agreement with “Caucasus Solar” Ltd for the construction of 2000 l total capacity solar thermal system was signed on February 23, 2012. The training for both Task Managers for solar projects and sub-contractor’s employees on Personal Protective Equipment (PPE) was conducted on March 9,2012 and covered the following issues: In what types of situations should PPE be used, eye and face protection; head protection; foot protection; hand protection; body protection. Minimum PPE equipment and their usage was discussed. The discussion around covered topics was accompanied by video material. After visiting the site HSE Specialist developed necessary HSE requirements to be observed during the installation of solar water heaters including: appointment by the sub-contractor of dedicated person for the implementation of HSE requirements on site, identification of potentials risks and necessary signs on site, issuance of daily work permits by assigned HSE specialist, PPE to be used on site and rules of their usage, HSE requirements during working on heights, mandatory safety rules while working with ladders, safety requirements during lifting works, HSE requirements during electrical works on connecting electric heaters to the power source, first aid issues and sanitary requirements to be observed on site. 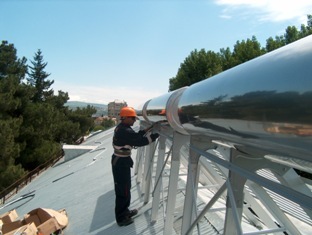 Before starting the site works the school administration was assisted in obtaining approval from the Tbilisi Municipality Architectural Department on the installation of solar system. The physical installation of solar system on school building roof lasted 6 days from May, 15, 2012 through May 20, 2012. The works on height were conducted in compliance of all the recommendations of EEC Georgia HSE Specialist who monitored the works on daily basis. After the installation of solar system on the roof the thermal meter and controller were installed and the works on connection of the system with the water supply system performed, including: arrangement of hot water supply piping to existing 8 washstands and their connection to the solar system; repair of 2 non-operating showers and 2 washstands and their connection to the solar system in the school corridor and connected to the solar system and tested. It should be pointed out that as reported at the initial stages of the project implementation the connection of solar thermal system with the existing heating system as it was initially proposed didn’t took place due to some serious technical problems with the operation of existing central heating system and estimated savings in natural gas consumption will not be achievable. O & M guidelines for installed solar thermal system for local staff have been prepared and delivered to the local technical staff upon testing of the equipment. The checklist for registration and calculation of ongoing outflow of electricity in order to compare electricity consumption after installation of solar thermal systems was prepared. The metering data are collected on a monthly basis beginning from September after the school year start. School administrative staff is actively involved in motoring process. 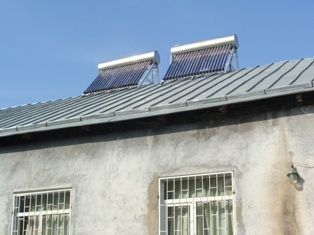 In September, 2012 the school administration requested reallocation of two solar collectors (with total capacity of 400 liters) on the roof of the school’s canteen in order to have the hot water in the kitchen. These works lasted 3 days from October 19 through October 21, 2012. As can be seen from the table for the period under consideration both electricity and water consumption has been reduced. In the below table the archived savings in energy consumption, bill saved and emission reduction for the period September 2012 - August 2013 are given. As can be seen from the table Total electricity savings for the period - 17482 kWh which is about 44%; Energy and water bill savings for the period - 16129 GEL; Emissions reduced - 6984 kg CO2. 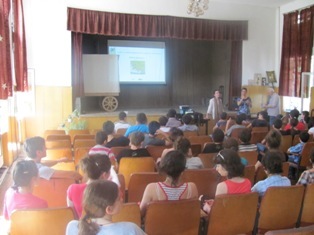 On June 14, 2012 the training in Renewable Energy Applications with emphasis on solar energy was conducted for schoolchildren and teachers. The training was conducted with the assistance of teacher to ensure sign language translation for the children. During the training video material illustrating the solar energy applications was demonstrated. After the training the participants received sets of brochures and leaflets on renewable energy applications. On June 20, 2012 the solar system commissioning event took place. The event was attended by the representatives of donor organization BP Georgia - Mr. Zurab Topuridze, Ms. Kristina Khabalashvili, Mr. Giorgi Gongliashvili, Ms. Tamila Chantladze, Ms. Irine Kurdadze (deputy Minister representative of Georgian Ministry of Education & Science), school personnel, representatives of Energy Efficiency Center Georgia and media. Special information stand was prepared and installed at the entrance of the school #203. The stand contains information about project donors and implementing organizations as well as description of installed solar thermal systems and achievable savings in energy consumption and environmental benefits. The preliminary information on the solar thermal system commissioning event at school#203 was disseminated through the press-release prepared by PR consultant of the project. The commissioning event was covered by invited media. The press release and copies of TV spots broadcasted by various media could be seen in. The information on the event was also uploaded on EEC Georgia’s facebook.